Tomorrow is report card day for my oldest son. He's fine, I'm of course nervous. I know that I shouldn't view reports cards as a reflection of myself, but of course I do. It's as if I am being graded, not him. I know that he is doing great and everything will be fine, but there is something about seeing it in writing that validates all the hours of homework and work books. My plan for tomorrow is to bake gluten free cookies and banana bread. I love to bake and cook and it is one of the best stress relievers that I know. I can literally calm myself down from anything that's bothering me by spending time in the kitchen. The last couple of months have been very busy and as any frequent readers know these are the times that I turn to my crockpot. I love my crockpot and it has saved me so many times. Last week I tried a new recipe for Mediterranean Chicken from the September issue of Parents magazine, which with 40 grams of protein looked perfect for a weeknight meal. This recipe has 9 ingredients. It takes a total of 7 1/2 hours, 20 minutes of which is active and makes 6 servings. I had no problems finding any of the ingredients at my local grocery store and I made no ingredient modifications. Makes sure to squeeze the lemon over the finished chicken, if you don't do this step the dish will not taste complete. To serve this dish I placed the vegetables on the plate and topped with the chicken. This looked great on the plate and allowed the flavors to be eaten as one bite. I followed the remainder of the recipe as written. I was very surprised by how great this recipe looked and tasted. Crockpot recipes are often reduced to stews and soups, without a lot of variety. This recipe tasted liked it could have come out of a dutch oven that had been cooking in the oven for hours. The taste is on the mild side, don't expect this recipe to be bold. It tastes like a dish that would come out of a grandmother's kitchen. The meat was perfect and the vegetables were very popular with my two sons. This is a recipe that I would definitely make again. For the recipe go to Mediterranean Chicken. Thanks for stopping by Big Foot Tribe and joining the blog hop. I'm following now and look forward to more yummy recipes! He will probably do fine.Sounds like a great meal. I will try it one day. Thank you for stopping by NovelCreativity. I'm a huge Mountaineer fan having grown up there for 24 years. It's so nice to see a blog that's specific to home :) I'll be sure to stop by often to get some meal inspirations from you! 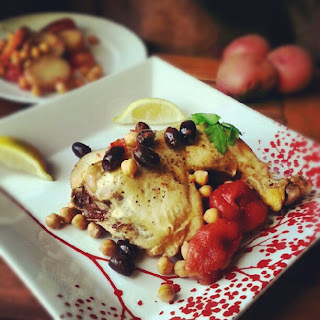 I love finding new blogs with ties to WV :) I hope you come back and try some new recipes!